Jon’s life isn’t that interesting. Nursing a bad day job and a private longing for musical glory, Jon falls in with an enigmatic indie rock band with potential, despite not having much talent himself. The rest of the band notices this and they don’t particularly endear themselves to him. The leader, Frank, takes him in anyway, perhaps seeing impressionability as a quality good enough to enter their cultish retreat in the woods of Ireland. Frank’s energy and his songwriting power keep the band members in his orbit. At times he seems to run the compound like a religious leader. Maggie Gyllenhaal as Clara, a theramin and keyboard player, is severe, necessarily though, because Frank (Michael Fassbender) also needs protection. He wears a giant paper mache mask to hide his identity. A voice comes out that is distinct, and humorous. He tells people he likes the expressions the happy face is really making: “non-threatening grin”. What has caused him to hide behind the mask, only Clara may know. 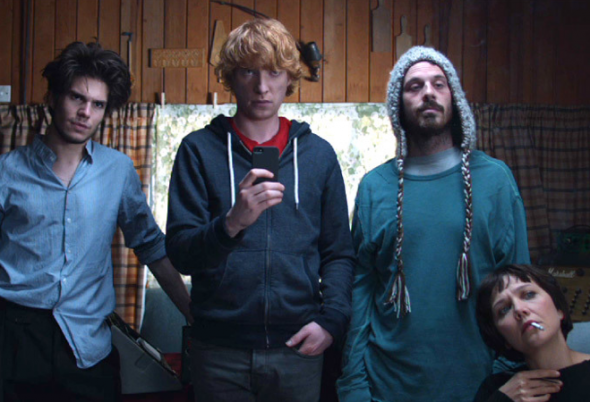 There’s a lot we don’t know about the band, as the filmmakers have switched it up by choosing an unreliable narrator in Jon (Domhnall Gleeson; Bill Weasley of Harry Potter). He doesn’t know all, we know, since he listens to YouTube clips on how to be creative, while the rest of the band is immersed deeply in the creative act. Sometimes so much so that nothing gets done for a year. Jon is so preoccupied with social media that he might be missing some of the things that lend depth to the band’s energy. Guys like Jon can’t even get attacked by a knife without recording the one-of-a-kind experience. But with this talent for promotion he wins the band a trip to the South by Southwest music conference in America, where the potential for fame awaits. Jon tries to talk Frank into writing a “likeable” song (at the risk of losing indie cred). Fights and miscommunications ensue. One of the filmmakers’ points is that the mental health of the band is affected inversely by the number of You Tube followers they have. 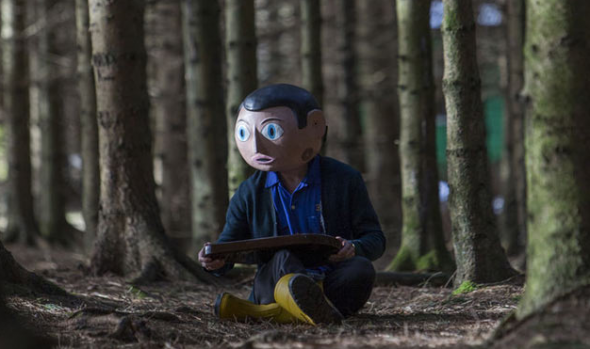 Michael Fassbender’s riff on Frank shows the same outsider courage and spirit of the original Frank Sidebottom, a creation of deceased comedian Chris Sievey. The handsome and dynamic face is taken out of the movie almost entirely. His body moves freely in the cabin. His voice carries the songs out of chaos. He negotiates band and landlord politics with grace as long as he has been creating his way. But as noise from the outside world enters via Jon, Frank’s motions become more herky jerky and unpredictable. The more Jon meddles, the more destabilized Frank becomes. In Jon’s head Frank has had a troubled childhood, which is what Jon believes must make for art great. But he is mistaken. Frank is simply hurt. The mental illness, we will learn, actually slows down his creative output. In the third act at Frank’s last sanctuary, the actor’s body becomes a clinched citadel, keeping the brain away from all errant sensations, and frozen at the piano. The challenge of band leading was more exhausting than Jon had realized. The artist was negotiating the thin line between mental illness and creative genius. There were a lot of good films at this year’s deadCENTER film festival. “Frank” seems to most invite writing. Probably because of its weirdness. It is executed with an off-beat spirit that works. A critic will be skeptical of a movie involving a touchy indie rock band led by a man who wears a giant paper mache mask. I once met a man who knitted gloves for a visiting indie rock act. If we were in a crowded room where music was playing he’d look around and confide to me how other people were putting on airs. Though it seemed to me his quiet and evasive manner, the funny voice, the large glasses were airs as well, features designed to stand apart from the crowd that was trying to stand apart. I don’t know what he’s doing now. He often had carpentry jobs set up in Colorado. In my memory he was a part of the culture “Frank” explores. The film also explores Frank’s character. And Frank is different. He wouldn’t be able to go pick up carpentry or accounting. He has to sing. “Frank” takes place in a quirky culture. In funny bar scenarios the musicans look different from the native Texans and Arkansans. Within their own rock show spaces, they try to distance themselves from each other. Here the filmmakers know the myths and truths of that lifestyle well enough to parody it (“Bluff Kansas,” says the ignorant Englishman of the American lead singer’s past. “Sounds dark”). But they also pay tribute to the lifestyle, with 1. light-hearted/surreal comedic bits and 2. impromptu music performances by the actors that vibrate with real energy, aggressiveness, droning chords and hidden beauty. Then they go a step further to expose the wound behind that will to weirdness. An appreciation for the artistic process and the quality filmmaking here ensure that the will to weirdness comes off as touching and mysterious, rather than annoying. Tagged Bluff Kansas, Chris Sievey, CITY, creative, deadCENTER Film Festival, film, filmmaking, Frank, Frank Michael Fassbender, Frank Sidebottom, Jon Domhnall Gleeson Bill Weasley, movie, music, OKC, oklahoma, writing. Bookmark the permalink.